Went fishing with Freddie G again Wednesday. We went to Lake Russell because it is pretty close to home and it looked as though it might rain so we didn’t want to venture off to far. On the way to the lake we had to stop by a fishing supply store. Fred can’t go fishing unless he stops and spends a $100 or so. I actually bought two $16 baits. Fred said they were had to have baits. I threw my new $32 arsenal for about an hour without a strike. Put on a 20 cent worm and caught two spots. Freddie caught six spots with his 20 cent worm. $32 zero, 20 cents two, counting Freddie’s which we must do the count goes to eight versus zero. 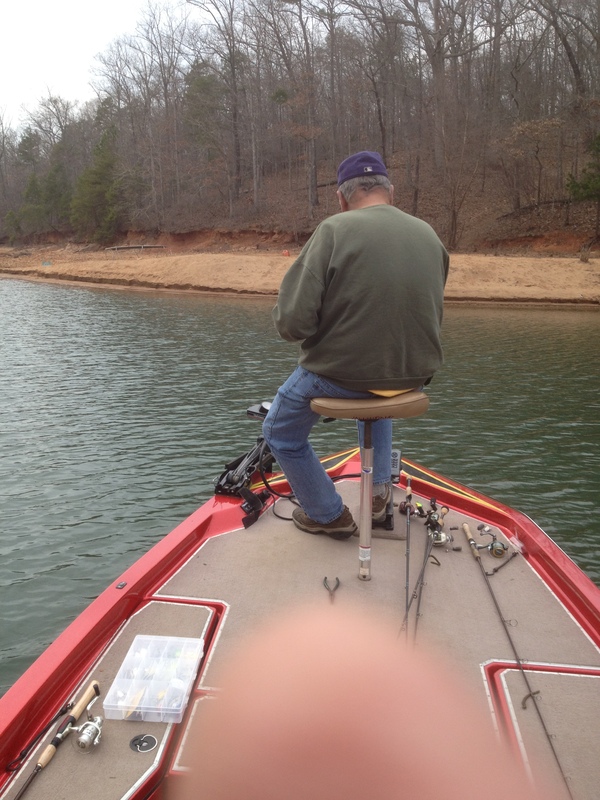 I caught the first fish, so Freddie immediately cranks up the motor and goes to the other side of the lake. Go figure? Freddie beat me again, and for the most part fair and square. I must admit that I made a terrible mistake. Freddie told me not to bring my tackle box cause I could fish out of his. You would think that was very nice of him, knowing that I had very little tackle and willing to share and all. I normally throw worms with blue in their coloring, got to have some blue somewhere. Freddie knew this from all the years we fished together. Did he have any such blue worms in his boat? Nary a one. Without blue my confidence level fell, thus my concentration fell. Chalk up another one for Freddie G.
Between having no blue worms, Freddie controlling the front of the boat and I having to spend so much time trying to scare off a flock of Buzzards circling Freddie, I was lucky to catch the two fish I did. Of course he tried to put the Buzzards off on me, but we both know who they were checking out. So Freddie now leads with eight spots, one junk….I got two spots, zero junk.